Crisp on the outside, but soft and pillowy inside, these garlic potato wedges are the perfect side to just about any meal! There isn’t anything quite like potato wedges. If you are like me, you need a nice balance of a crispy outside and an inside that is still light and fluffy. A potato wedge does this better than most fries. And it is easier to achieve than your typical fry. 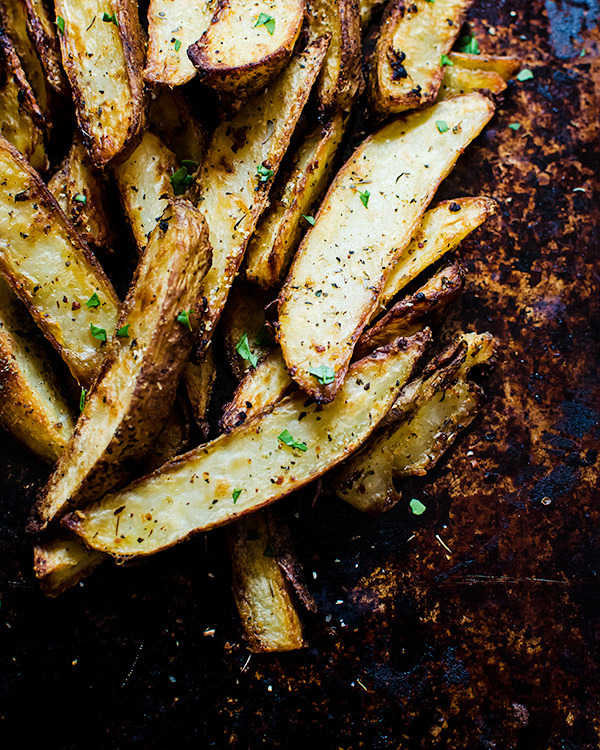 My favorite are garlic potato wedges because garlic makes everything taste phenomenal. I have a few tips to get the best potato wedges in your neighborhood, and I am going to share each and every one of them with you. First, you have to choose the right potato. I love baking potatoes because they give you the best interior and makes a great canvas for different flavors. Occasionally, I will make them with Yukon because of its inherent butteriness (and yes, that is a word – now), but I find it is trickier to get the right texture. Next, you want to parboil the wedges. I like to boil them for 4 – 7 minutes, depending on the size of the wedges. You want them still firm, but a touch softer than they were before. If you boil them too long, the skins will start to peel off. That isn’t the worst thing because you can still dress and bake the skins for a crispy treat, but then the wedges would be all naked and no one likes naked garlic potato wedges. Once they are boiled, cool them enough to handle, then gently pat them as dry as you can. Shake them in a bag of oil and spices for even distribution of everything, then bake away. 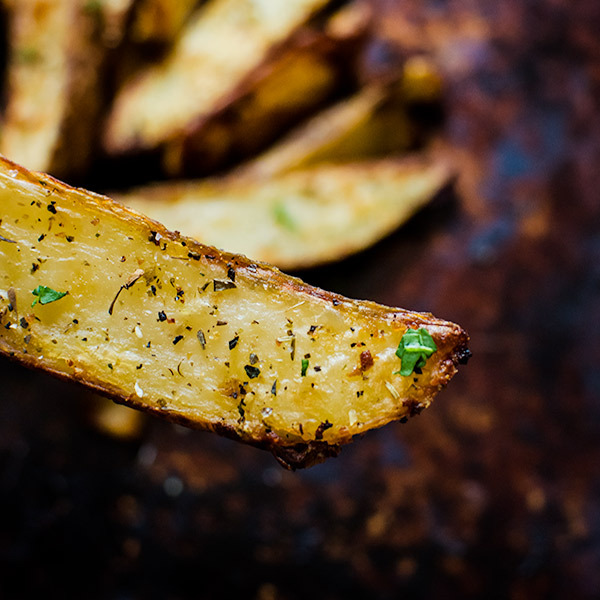 You see, just a few steps can take you to complete garlic potato wedge nirvana. Thoroughly wash the outside of your potatoes, scrubbing away any dirt. Boil a large pot of salted water and preheat the oven to 400 degrees F. Line two baking sheets with parchment paper. Cut the potatoes into wedges. You can do this by first cutting the potato in half lengthwise, then cutting each half in half again lengthwise. Repeat one more time to each piece. Keep the wedges in a bowl of cold water as you cut the to prevent browning. Boil the potatoes for 4 – 7 minutes. If you notice any skins starting to come off, remove from heat immediately. Cool the potatoes until they can be handled and gently pat dry. Fill a large gallon bag with the oil, garlic, and Italian seasoning. Put the wedges in the bag in batches. Shake to distribute the oil and spices. Place the wedges on their sides onto the baking sheet, leaving space between each wedge. Bake for 40 – 50 minutes, or until a nice golden brown. Turn halfway during baking.